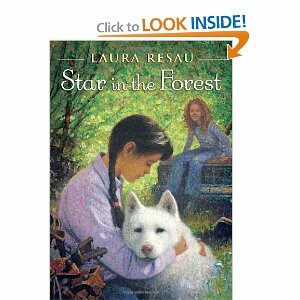 I hadn’t read a book with a topic like Star in the Forest before. I think I received an advanced review copy at NCTE. I know I’ve been spending a lot time reading young adult books, so I was scouring my to-be-read book shelf for something more middle grade, when this slim volume caught my eye. I had to stop to think if I’ve read a children’s book that has been set in a trailer park, and I couldn’t come up with a title. I could think of ones where characters, major and/or minor, have lived in a trailer that moves across country, one that is parked behind someone else’s home. No wait. As I writing and thinking, I just came up with Lucky from The Higher Power of Lucky. My brain can’t pull out any other titles. Zitlally’s family is illegal immigrants living in Colorado, and her father has just been stopped for speeding and deported back to Mexico. Unsure how to deal with the loss of her father, Zitlally withdraws into herself, only to find comfort in two unlikely friends: A dog she names Star who she found chained in the junkyard behind the trailer, and another girl, Crystal, who lives in the same trailer park. Through the friendship of Crystal and their mutual taking care of Star, both girls find comfort from some ugly parts of their lives. I really enjoyed the entire story from sad beginning to happier ending. If you are working with students, I would recommend having them read Zitlally’s Papa’s folktale from the end of the book (p. 132) when the tale first gets mentioned. For younger readers, I think it help them stay grounded in the story and prevent confusion. As my daughter is immersed in an immigration study this week for social studies, I’m thinking this would be a perfect book to introduce the idea of modern-day immigration, both legal and illegal. With the background knowledge of Ellis Island, I think many students would appreciate having a simple, hopeful tale to help build their understanding of current day immigration. A great story that I could see being a read-aloud, a literature circle selection, or a book used in social studies as part of an immigration or culture study. Sounds like a great book. I’m pretty sure BECAUSE OF WINN DIXIE is in a trailer park.